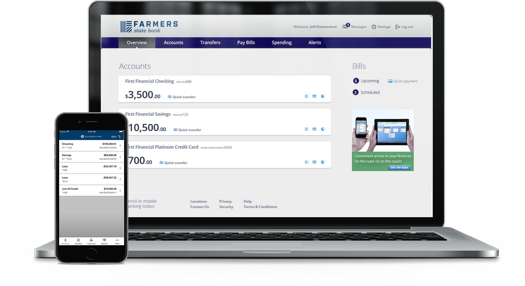 Our updated platform offers around-the-clock access to your financial information in real-time. All you need is internet access! Check your balances in real-time, and transfer funds with a click. The upgraded platform uses a variety of methods to protect your information, including account number masking, multi-factor authentication, and flexible security rights. While your new online banking experience may look better, it works better too! Get to what you need quicker find the info you want with ease. Complete your desired task in fewer clicks than ever before. Simply select accounts and activity you would like to monitor and receive notifications when your thresholds are met. If you want access to your financial information on your phone, click here to learn more about our mobile app! We’ve updated our online banking platform to bring you an improved experience! The upgraded platform uses a variety of methods to protect your information, including account number masking, multi-factor authentication, and flexible security rights. Our platform also uses multi-factor authentication and 128-bit encryption. While your new online banking experience may look better, it works better too! Get to what you need quickly and find the info you want with ease. Complete your desired task in fewer clicks than ever before.